China launched a Long March rocket Sunday and successfully orbited a Yaogan observation satellite believed to be on a naval surveillance mission, according Chinese state media and independent analysts. A Long March 4C rocket lifted off at 0406 GMT Sunday (11:06 p.m. EST Saturday) from the Jiuquan launching base in northwest China. 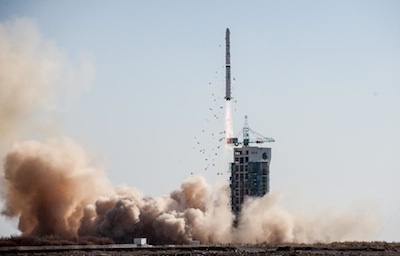 The three-stage rocket placed the Yaogan 16 payload into a 680-mile-high orbit with an inclination of 63.4 degrees, according to U.S. military tracking data. Launch occurred at 12:06 p.m. Beijing time, the state-run Xinhua news agency reported. The satellite was designed by the China Aerospace Science and Technology Corp., a state-owned space contractor, according to the Xinhua news agency. Xinhua reported Yaogan 16 is "designed for a variety of uses, including technological experimentation, land resource surveying, agricultural yield estimation and disaster prevention and reduction." But the launch of Yaogan 16 and its orbit suggest similarities to a satellite mission launched in March 2010, which consisted of three spacecraft flying in close formation. Experts believe the satellites track ship movements with optical and radar observation instruments. Experts believe the Yaogan 16 payload may also include three satellites. China's naval observation satellites are the counterpart to the U.S. National Reconnaissance Office's Naval Ocean Surveillance System, or NOSS, which include two or three formation-flying satellites in similar orbits. China's Yaogan satellites are likely run by the Chinese military, according to Western analysts. Sunday's mission marked the 17th space launch of the year by China.